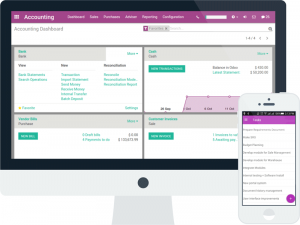 Odoo is a flexible, powerful enterprise resource planning (ERP) and customer relationship management (CRM) platform, capable of enhancing efficiency and providing a simplified workflow for businesses in all industries. Blue Stingray handles more than custom St. Louis Magento development for BHS they also maintain BHS’s ERP. Blue Stingray specializes in Odoo design and implementation, but this case presented a unique set of challenges due to size of the client’s operations (and the age of their old ERP). Battery Handling Systems, Inc. (BHS) is a leading provider of motive power and material handling solutions. As a market leader, the company serves an international base of clients, offering hundreds of high-quality products to businesses in the warehousing and logistics industries. BHS expanded its product offerings significantly over the past decade, but outdated ERP software was creating several issues.BHS needed a custom ERP and CRM solution that was powerful, flexible, and easy to learn. Blue Stingray began work on the project in June of 2015. BHS used a General Data Systems (GDS) ERP, which was developed in the 1970s. The ERP was “outdated, clunky, and archaic,” and numerous issues prevented the BHS staff from using it effectively. It only allowed a single user to log in at a time, and the software was not flexible enough to adjust to the BHS workflow. It used an end-of-day accounting system that wouldn’t allow staff to see the chart of accounts until a day later, which created unnecessary confusion and substantial workflow issues. To compensate for the poor user interface and lack of modern features, staff used other software to log inventory, generate quotes, log customer interactions, and track shipments. In total, the company used six different systems, including two separate systems for sales (Quotewerks and SalesLogic). Despite these challenges, BHS was maintaining a position as a market leader, and the company maintained a strong customer service record. However, new staff members had to undergo extensive training to know how to work efficiently with six separate systems, and even with regular training, workflow problems were inevitable. BHS asked the Blue Stingray team to create a single, simplified ERP/CRM solution that was both flexible and user friendly. The new solution would need to offer the same functionality as the six systems that were currently in use; however, new features would need to be implemented on an ongoing basis. Most importantly, the staff would need to be able to use the new system right away. Phase 1: Blue Stingray’s team would develop the basic features of the custom Odoo ERP/CRM, perform essential testing, and prepare to train the BHS staff. Phase 2: Blue Stingray would oversee implementation of the software by sending a team to BHS. BHS staff members would receive training directly from Blue Stingray’s team, who would also immediately address implementation issues. Phase 3: The Blue Stingray team would develop additional features and Odoo apps as needed for the next six months, providing BHS with a fully functional solution that could adapt and grow. Over the course of implementation, the BHS staff would need to discontinue the use of its current systems. This made the first and second phases of the solution especially important, since any major efficiency issues could seriously endanger the day-to-day operations at BHS. Blue Stingray’s team completed a detailed audit of the BHS workflow, studying the processes used in manufacturing, sales, accounting, and inventory tracking in order to build the most effective system possible. The team wanted to avoid implementing any inessential features, at least for the first phase of the project, to reduce the inevitable “culture shock” that comes with a new CRM/ERP system. Many of the changes were simple, but extremely helpful to the BHS staff. Barcode scanners and tablets were used to track inventory, reducing error and improving efficiency. Old end-of-day accounting systems were replaced with real-time, flexible alternatives. The sales staff benefited from some of the most substantial changes. The old CRM was divided into quoting and sales tracking. Blue Stingray consolidated these processes with Odoo, which redefined the sales workflow at BHS. Additionally, thanks to a geolocation feature in the CRM, contacts could be mapped out by location, allowing for a clean visual representation of BHS’ growing client base. Most importantly, every process was handled through a single system. This allowed for a relatively simple first few weeks, although the Blue Stingray staff still worked overtime to prevent BHS from incurring any downtime as a result of the implementation. Blue Stingray continues to develop custom Odoo features for BHS, and the Blue Stingray team regularly visits BHS to provide ongoing support. Please call Blue Stingray today at 314-266-8097, email info@bluestingray.com or fill out the contact form to schedule a demo.